Rolled at the TABSA (Casa Fernandez) factory in Esteli Nicaragua, the brand (Warped) owner is Kyle Gellis. I am smoking the production “5205” version a 6.3″ x 42 a longish corona they call a lonsdale. So this looks like a great cigar right? Well yes it is, but it isn’t really my cup of tea. Read on.. Cold aroma: Rich manure, barnyard, leather. This is a rich smelling wrapper! Cold taste: salty, grassy, and a little lemon-grass sour. Construction: The sticks I smoked (five so far) were all pretty good. Light brown smooth wrapper, a few small visible veins. Evenly packed. Not super-dense, but not light either. Draw was medium and mostly stayed that way. Smoke output excellent all along the stick. Burn line required a minor correction from time to time but no big deal. Smoke time almost 90 minutes. Overall an “A” for construction. Flavors: When first lit I get fresh hay, flowers, brown sugar, nuts, and sweet woods — like burning dry maple leaf. Only a little pepper tingle to speak of. Getting into it a bit there is a hint of candy-like sweetness on the retrohale and a very little bit of white pepper, still a tingle and very rounded. Pairing this stick with a mild rum I also get a hint of spearment in the smoke. As I smoke a little more a mild sourness (some call this an umami-sort of flavor, I like to think of it as cabbage cooked in tomato juice) that reminds me of the twang one often finds in Dominican cigars, something I cannot remember sensing before in a Nicaraguan Puro. In the middle of the cigar, the nut, sweetness, and woods fade a bit and the grassy vegetal comes up along with that sourness. Pepper goes up a bit on the retrohale, but never dominates. In the last third, the sweet woodiness returns along with some leather. A bit of that sourness remains throughout. The cigar stays pretty much medium in strength, but because it is rather long, it will give you a buzz by the time you finish it. 3. Must retain flavors (and not become merely hot smoke) down to the last inch at least — I like to go to the last 3/4″. 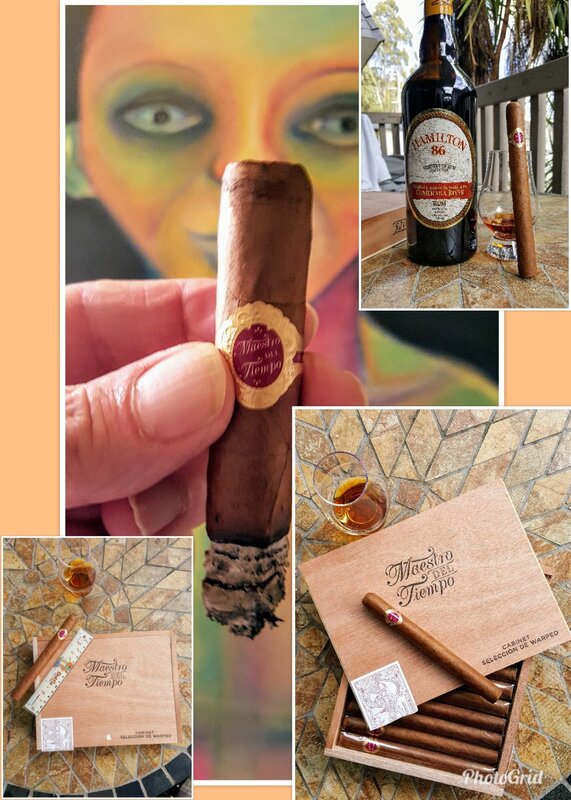 This cigar qualifies on all three points, but still of all the Warped cigars I’ve tried I like this one the least and that because of the sour note that gets more noticable through the middle third of the cigar. I have smoked many AGANORSA Nicaraguan Puros and I cannot remember that sourness in any of the others. I can handle a little of it and this stick is fine, the note never dominates the flavor and lots of smokers love it. This will be a great stick for a lot of people.